Purchase Order Software provides a new way for business managers to maintain entire PO transaction process useful any big or small business organization. Preferred choice for companies who need to maintain and efficiently tackle various sales and purchase details in easiest way. Easy to use program maintains the records of customers and vendors, and manage items records which are sold, purchased or returned. Software creates invoice and receipt records for sales/purchase items, and prepares real-time reports that reveal overall purchase order detailed performance. Customized purchasing software suits your needs and budget uses to maintain the overall sales and purchase records at one place. Wizard enables all kinds of companies and organizations to organize and manage sales/purchase process information in an efficient manner and accurately maintain customers and vendor details. The program provides user-friendly GUI interface that helps users to understand the features and working of software. 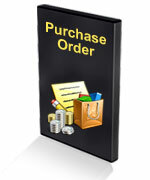 Automate the entire sales and purchase order process. Creates and maintain Company-Customer details, Vendor records, Sales, Purchase and Returned item details and other financial transactions. Generate fast and accurate business reports including Delivery/Receipt reports, Invoice report and Sales, Purchase and Item transaction reports. Software auto-generate purchase order, eliminate duplicate data entry (unauthorized purchase) and automatically update the inventory and stock details. Password protected feature helps to restrict the unauthorized accessing of confidential files and folder by external users. Option to export accounting records in Excel file format. Saves time and labor while maintaining the purchase order records. Manage and process business operations from single computer system. Friendly GUI interface and easy to operate. Useful software solution for small, midsize or large business enterprise. Facilitate data backup and restoration facility in case of accidental data loss. No complex technical skills are required to work with software.